(AKA The Spooky Movie Show, Eyes of Hell, Eyes From Hell) 1961, Starring Paul Stephens, Charlotte Nevins, Anne Collings, Martin Lerut. Directed by Julian Roffman.
" Put The Mask On-- Now!" 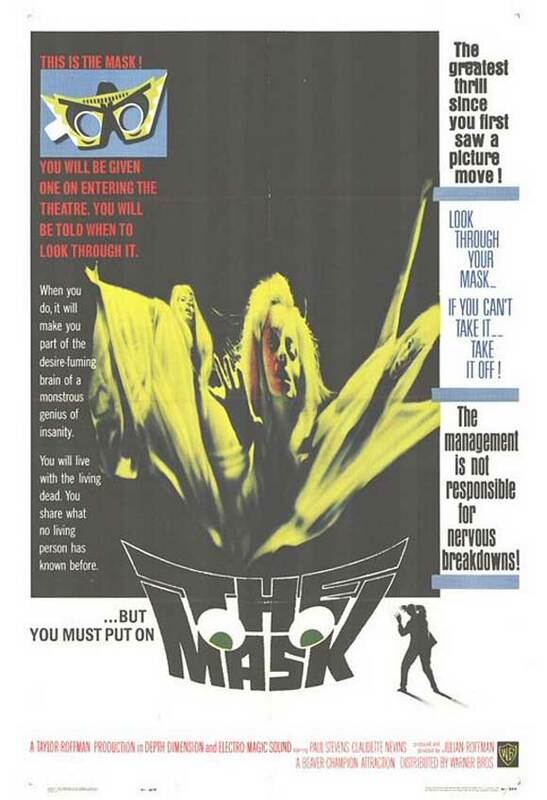 The Mask is an excellent psychological horror film that is important for many reasons. It was the first Canadian film to be distributed in the US by a major studio (Warner), it has a full cast of Canadian unknowns, and it succeeds in creating the surreal atmosphere found in cult classics like Invasion of the Body Snatchers and Carnival of Souls. 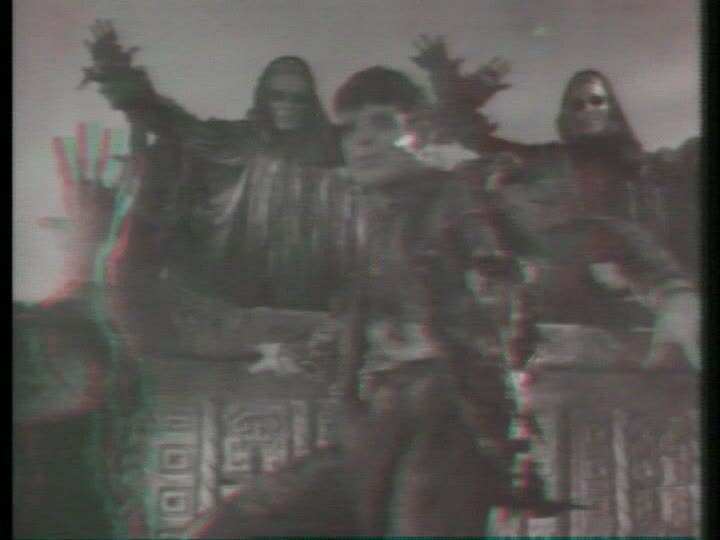 The Mask also stands out as Canada's only contribution to the original 3-D fad (The other, Spacehunter: Adventures in the Forbidden Zone, was released during the 3-D wave of the 1980s). This is curious in itself as The Mask was released 4 or 5 years after the trend had died out in Hollywood. In the theaters, movie patrons were actually given a cardboard mask with built in 3-D glasses that they were instructed to wear whenever they heard a character say: " Put the mask on-- now!" Although Julian Roffman, the film's director, had made military training films for the NFB during World War II, he left the Board to make feature films in the late 1950s. With Canadian exhibitor Nat Taylor's wife, he formed Taylor-Roffman productions, and made The Bloody Brood, a story of beatniks and crime which starred Peter Falk in his first role. 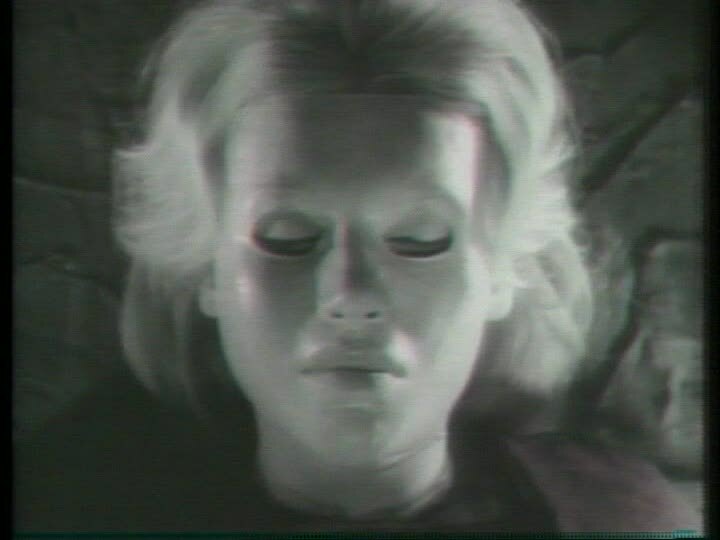 In 1960, Nat Taylor built a studio in Kleinberg, Ontario, which Roffman used to direct The Mask. The movie opens with an innocent young girl being chased by Michael, a crazed young man who eventually catches and strangles her to death after receiving a large scratch on his face. Michael proceeds to his psychiatrist, Dr. Barnes and explains how he just had a dream of killing a young girl, and keeps blaming a mask for his strange behaviour. Dr Barnes tries to help, but can't convince Michael that his ailment is unrelated to the mask. Frustrated, Michael returns to his boarding house and mails a large package before shooting himself. The police start to investigate the suicide, visiting the museum where Michael worked as a professor of history to speak to one of his colleagues. They learn that Michael was catalouging an ancient Indian ritual mask at his home, and that the item has since gone missing. They also relate the mask's legend-- apparently, the wearer is put into a hypnotic trance and commits cruel and unnatural acts. The police proceed to visit Dr Barnes, who discusses Michael's case with them. During the entire conversation, the package that Michael sent before his death is sitting on Dr. Barnes' desk, but is not directly called attention to. It is in almost every shot, but a first time viewer will discover it at the same moment Dr. Barnes does, when the police leave. Of course, the mask is inside, along with a letter daring Dr. Barnes to try it on. And he does, which leads to the first 3-D sequence. Essentially Barnes sees himself as Michael, and is in some sort of chamber with a giant mask. Three hooded figures are trying to sacrifice a young girl. He is assaulted by all kinds of skulls, flying eyeballs, fire and snakes in this nightmare world, fully exploiting 3-D better than most of the original 3-D films. Dr Barnes' girlfriend Pam wakes him from his trance, and he tells her that the mask can see subconscious desires. He seems to be obsessed by the mask, and believes it is speaking to him. Pam gets scared, grabs the mask and returns it to the museum. Barnes promptly steals it right back, goes to his office, and takes his second trip. This time, he is in a room with the same girl leaning against a giant claw. More fireballs fly at the audience, and the audience realizes that the mysterious nightmare girl is a dead-ringer for his secretary, Miss Goodrich. 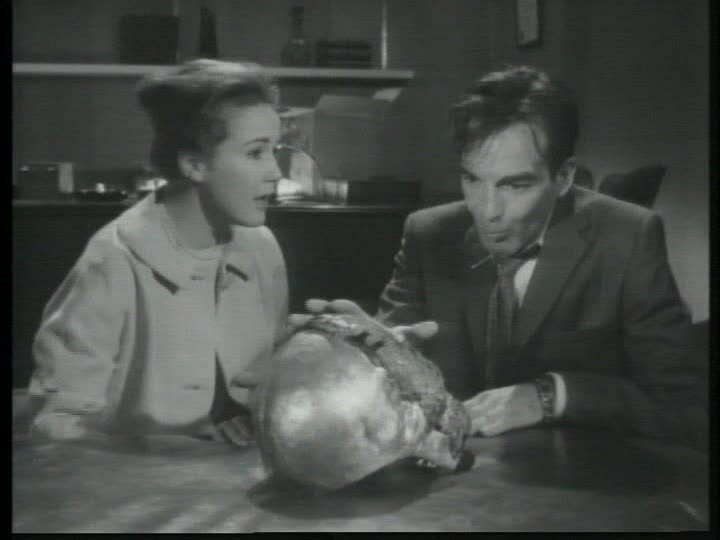 Once Dr Barnes removes the mask, he offers to drive Miss Goodrich home. When she declines, he professes his love for her and offers again. This time she agrees. While driving her home, Barnes starts kissing her while his gnarled hand creeps ever nearer to her throat. Snapping out of his dream-state, Barnes decides to visit his old University teacher, Professor Quincy. 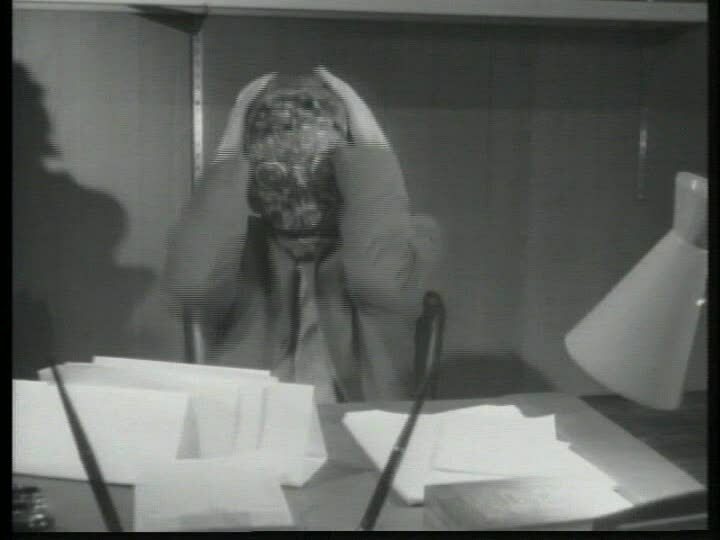 Professor Quincy agrees to set up a supervised session to explore the "psychological possibilities" of the mask, and Barnes puts it on again for the third and final 3-D segment. It is also the best, the highlight being a ragged ghoul who paddles a coffin down a river. This third nightmare drives Dr. Barnes over the edge, and he escapes the professor's house to pay another visit to his secretary. The two drive off together, and this time Barnes is a little more candid about his purpose, actually telling Miss Goodrich that he plans to kill her. She is frightened, and when his hand snakes around her throat again, she scratches his face exactly like Michael had his face scratched at the beginning. After she escapes, Barnes goes back and tries to force the mask on his wife, with the police banging on the door. This was probably the first Canadian cult movie that I had ever seen, and still remains one of my favourites. Obviously, the mask is a metaphor for drug use. Dr Barnes starts using it, and has hallucinations. He quickly becomes addicted and then crazed to the point of trying to kill others. At one point his girlfriend Pam actually refers to the mask as a drug, and is extremely worried over his obsession with it. As with most movies of this nature, the message is mixed. The hallucinations are portrayed as " fun," but the consequences are "bad." The Mask is definitely darker than American films of its time, and could almost be considered a film-noir with its haunting musical score and shadowy atmosphere. Both The Bloody Brood and The Mask establish Roffman as one of the brightest talents that arose in this crucial time in Canadian film, which makes it such a shame that this was Roffman's last directorial effort. With the Taylors, he still remained active in Canadian film, and went on to produce a few Canadian movies in the 1970s, such as Explosion, the first movie funded by the CFDC and the bilingual crime film The Pyx. 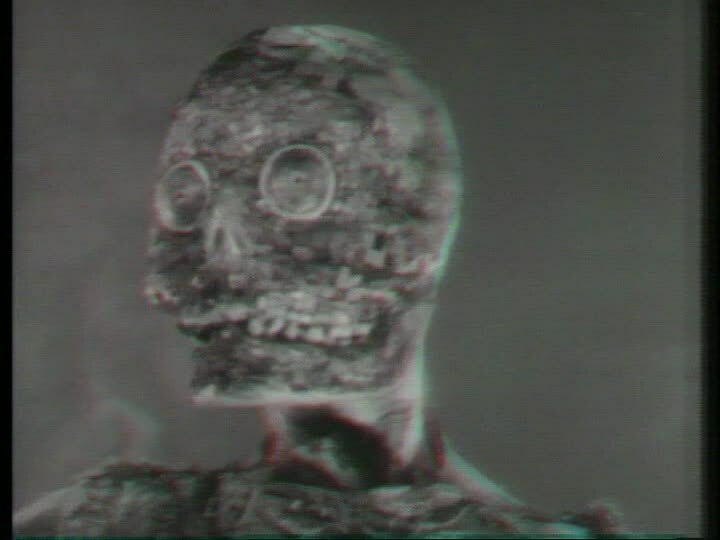 More than just a predecessor to the Canuxploitation of today, The Mask is also the earliest Canadian example of a horror film.